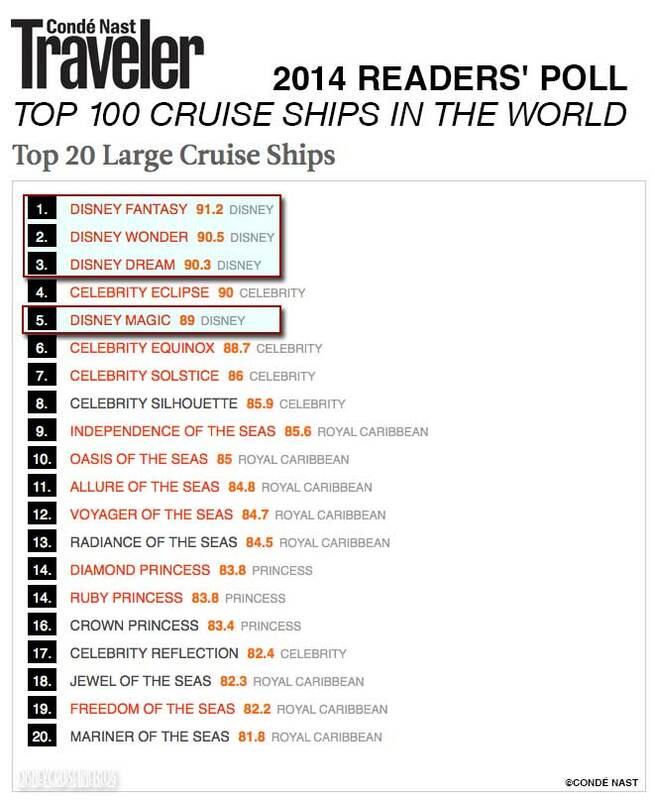 The results of the 2014 Conde Nast Readers poll have been tallied, and once again Disney Cruise Line commandeered the top 3 spots in the Large Cruise Ship category. Moving up from the number 8 spot in 2013, the Disney Fantasy was named the #1 large cruise ship in the world for 2014. The Disney Wonder and Disney Dream remained in the 2 and 3 spots. The re-imagined Disney Magic dropped from the top of the list to fifth place. The Disney Fantasy finished almost a full point ahead of the the others. The Disney Dream and Disney Wonder were only separated by a two tenths of a point. Here is a look at how the Disney ships compare based on the reader feedback over the last year. Based on the 2013 Reader’s Poll, the Disney Fantasy had the most ground to make up, and she did so by improving in each category. I am surprised that the Disney Fantasy leads the Disney Fleet in the itinerary category considering the Disney Magic and Disney Wonder sail a myriad of unique sailings from Alaska to the Mediterranean compared with to variants of 7-night Eastern and Western Caribbean sailings. Personally, I think the Disney Magic has the best itineraries in the fleet followed by the Wonder, but then again there were almost 80,000 readers that participated in this years poll. While Disney’s newest ship topped the list, the flagship, Disney Magic fell four spots from the top this year. The Disney Magic saw an improvement in the food category, but dropped in almost every other category. I am checking with Conde Nast Traveler to find out when the survey period closed, but this survey potentially omits reader feedback from after the Disney Magic’s re-imagination. Regardless, for a ship that has been sailing all over the world for 15 years this is still am impressive showing. For the 2014 Readers Poll, Condé Nast Traveler readers rated 440 ships on a 100-point scale. Each ship was evaluated on seven criteria: Activities/ Facilities, Cabins, Crew/Service, Design/Layout, Food/Dining, Itineraries/Schedule, and Shore Excursions. Only ships that received a required minimum number of responses from the 79,268 participating readers were eligible to be included in these rankings. What are you thoughts on this year’s Conde Nast Readers poll results? Did you vote? This entry was posted in News and tagged 2014, Condé Nast by Scott Sanders. Bookmark the permalink. This is unrelated to the post, but…. do you know if the “Welcome Back Stateroom Gift” for CC members changed for 2014? If not, do you know where I can find this info? Thanks! The biggest change is that the backpack has been replaced with a tote bag dependent on your Castaway Club level. Scott, another unrelated question; any news on the Wonder’s drydock and how it is going? I will be sailing on her in November. Ken, the work to the Disney Wonder seems to be the standard routine maintenance update. I’ve shared a few pictures on twitter, but there has not really been anything all that interesting to pass along.